Stripping the layers of wallpaper in the flat has turned into quite an adventure. Each time I begin to scrape a layer off, another pattern begins to emerge and I slow down as I try to find a whole section of pattern. 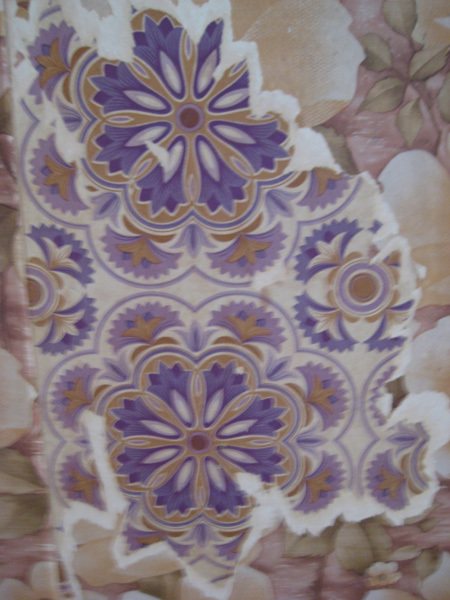 This is making the wallpaper stripping quite time consuming especially on the walls with several layers. I have been leaving the sections I like on the wall so the flat has taken on the look of a rather worn pattern book. Some sections of paper are so old they just flake off in to nothing so I am planning to just bash of whole sections of plaster to preserve them, although I’m not sure how effective this method will be. I think the oldest one I have found so far dates from the 1850’s. One of my new neighbours is something of a wallpaper expert and has very kindly leant me a book on the history of wallpaper so I am trying to date the different layers, not entirely successfully. And I haven’t even begun in the plastic panelled rooms yet!